Polyaniline (PANI) emeraldine salt form and PANI/silver composites have been synthesized by sonochemical and ionizing radiation methods. 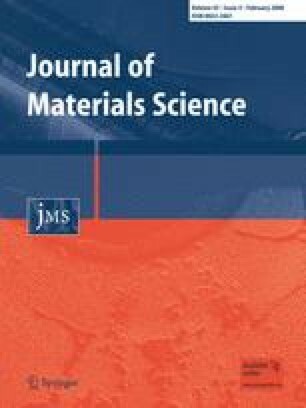 These composite materials were obtained through sonication and γ irradiation of an aqueous solution of aniline and silver nitrate, in room temperature, respectively. The mechanisms suggested to explain the formation of these products are based on the fact that both methods produce hydroxyl radical •OH and hydrogen radical •H, where hydroxyl radical •OH acts as an oxidizing agent in the polymerization process of aniline monomer; and hydrogen radical •H, as a reducing agent for silver ions. Spectroscopic, X-ray, and SEM measures show that PANI and silver nano particles of 40 nm average diameter are produced with ultrasonic methods, whereas silver nano particles of 60 nm average, and fibrillar, highly network morphology for PANI with 60 nm fibrillar diameter average are obtained using γ radiation). The authors thank Mr. Francisco Rangel for his assistance on SEM measurements, Marcela Bianca for comments and suggestions for the manuscript, and acknowledge financial support received during the development of this work from REMAN contract N. 550.015/01-9, CNPQ contract N.305587/2003-0 and N. 473.144/03-4 and RENAMI.